600RR.net > Meeting Point > United Kingdom > London bike mechanics? 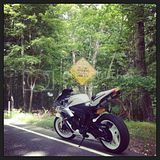 CBR600rr-7. Im located walking distance from Ace Cafe. Location: Irishman in Long Island, NY. It's all easy stuff and ready info on here. And if you were to run into some trouble there is always someone in here willing to help out the big plus is it's cost saving. And it nice to learn and be independent. it's all basic stuff, even i have taught myself to do these things and before i had never worked on anything. just make sure you read a good manual and there are loads of guides on here, just do a search. all done. Glad i did it ourselves. Know the bike much better now. and you saved money which can buy some toys for it now. see it's a win win situation. Good to tinker with your own bike, especially the maintenance stuff. Get a Haynes Manual, they are worth their weight in gold trust me!